Memories are a very big part of who we are. Sometimes they pop up at the most odd times and sometimes we recollect them because of a place or event. I have memories of growing up, and memories of yesterday. As I am getting older I am noticing the memories are getting harder to bring back. This picture is a memory I do not have. 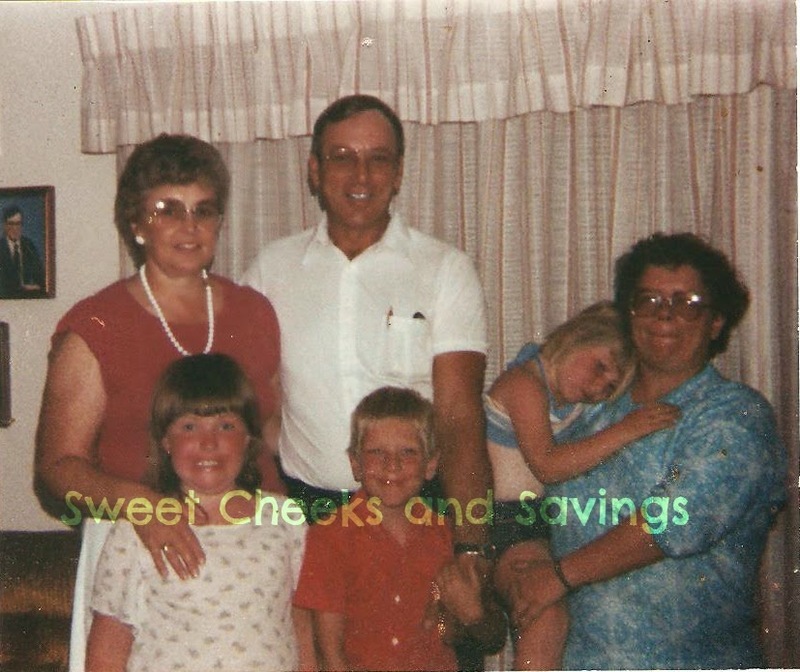 As you can probably guess, I am the little girl leaning on my mom. Who knows why I am leaning on her? Possibly I didn't want my photo taken? Maybe it was late and I needed sleep? Either way I am happy to have this picture to remind me that this moment happened. Also I'd like to point out, How would I be able to giggle at the face my sister is making in this photo if I did not have it? I know when my children get older, they will have the same issue of not remembering every small moment of their childhood. I do my best to print our favorite pictures and post them around the house. This is where Easy Canvas Prints has come into play for my family. I asked them to print my absolute favorite picture I have ever taken of my family in form of an 8x10 canvas. I couldn't be happier with my decision! They helped me transplant this picture perfectly from my computer onto the wall! This picture was taken shortly after my husband and I moved our little family to Pennsylvania from Kansas. We didn't know anyone, but were determined to make the best of a new and possibly exciting situation. Eager to let the kids run after a winter, we found this park. The park fits our family perfectly! Swings, a jungle gym area to play on, and a nice grassy area to throw around a baseball. I had no idea how beautiful this picture would turn out when I shot it, but once I got home and was looking through, I instantly fell in love. To me it shows the love of a father and his children while playing in a park. Simple, but speaks so loudly. 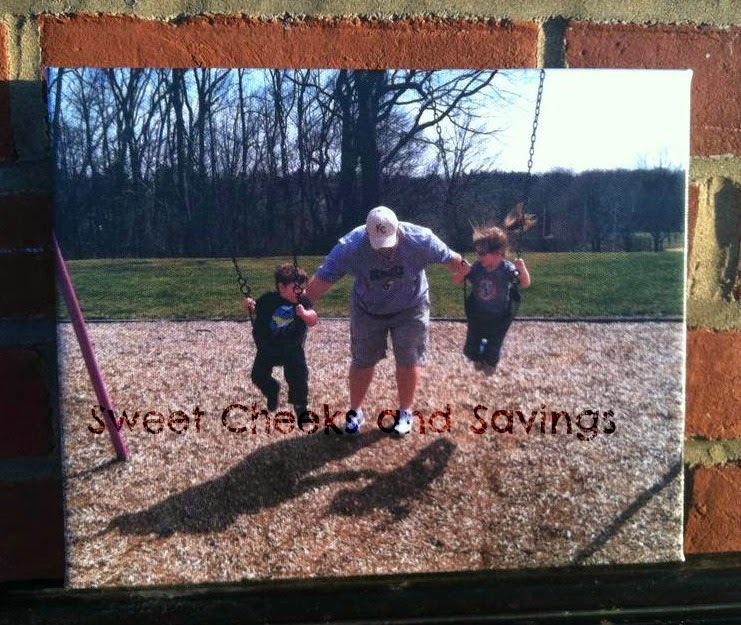 Disclosure: A special thank you to Easy Canvas Prints for giving Sweet Cheeks and Savings this opportunity to work with them. We received these items free of charge from Easy Canvas Prints. No monetary compensation was received or offered, nor were we under any obligation to write about this product. All opinions expressed are honest thoughts. We were not offering any sales or taking orders for this item. We will not receive any compensation in connection with any sales of this item. I was never good at smiling...I think it was in 1987, I'm 9 you are 4 and dad is the photographer. the only vacations we ever took were the family reunion. you have to ask our Great Aunt Donna which house was this at. I love these kind of pictures, and you are so right about having those images saved for the little ones. Children remember a lot of things but I've found it's rarely the same as what the parents remember. Things we forget, they cling to. I like the idea of canvas prints. I've been seeing more and more of these canvas prints. They look great but I wonder what their real lifespan is and how bad they'll fade. I love your picture choice! I've always preferred printing pictures that capture a real moment. While professional posed pictures are nice here and there, the real moments are the ones I want to remember. Love that picture that you chose. I think canvas prints are so neat and yours definitely came out awesome. I really like turning some of my favorite photos into canvas prints they are so cool looking. I also prefer "real" photos instead of staged. the staged portraits always seem less sincere, some downright fake. Love the picture, it's so sweet. We have many pictures of the kids when they were younger, but there are many moments I now wish I had captured. Ah,,, What a cute picture! How sweet! We used Easy Canvas before and got some great results with our pictures. Great pictures; they got me thinking of some of my childhood memories and the many friends who are not in my life anymore. I have a couple canvas prints from them and love them. The quality is great. I plan to get a few more once we buy our next house so I can have a wall of memories. I already regret not having enough baby pictures and my oldest is only 9. Love your canvas print! I've never heard of Easy Canvas Prints, but it sounds right up my alley! Good resource! Photo capture so many memories. It's important to print them out and enjoy them. I need to do more of this. I am such a big fan of canvas prints. I have a few of them from Easy Canvas Prints actually! Photos and memories really does come together. I would use a picture I took of my grandson on his swingset a few months ago.